Sept 2nd. We start the new season with the wonderful Hissyfit. We start the new season with the wonderful Hissyfit. Hazel and Linda are on their third visit to the Diamond. Linda’s songs give us a window to what it must be like to earn your living from the seas as well as the people at home waiting. 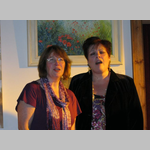 Expect some gorgeous harmonies and a varied repertoire. You have heard the songs sung by others so come and see the real thing. Bring your voices and come early.